Facebook is in crisis mode, but the company can take major steps to fix itself – and the global community it says it wants to promote. Facebook founder, CEO and majority shareholder Mark Zuckerberg need not wait for governments to impose regulations. If he and other industry leaders wanted to, they could make meaningful changes fairly quickly. It wouldn't be painless, but Facebook in particular is in a world of hurt already, facing criticism for contributing to civil unrest and sectarian turmoil around the world, delayed responses to disinformation campaigns, misleading users about data-handling policies, and efforts to discredit critics – not to mention a budding employee revolt. Facebook, Twitter, Google and other social media companies are causing society-wide damage. But they tend to describe the problems as much smaller, resulting from rogue individuals and groups hijacking their systems for nefarious purposes. Our research into how social media can be exploited by manipulative political operatives, conducted with Joan Donovan at the Data & Society research institute, suggests the real problem is much larger than these companies admit. We believe the roots lie in their extremely profitable advertising systems, which need a major overhaul. We have identified some key changes that these giant powerhouses could make right away. These moves could reduce opportunities for political manipulation and limit the harm to democratic societies around the world. Facebook, Google, Twitter and other social media companies have built an enormous digital influence machine powered by user tracking, targeting, testing and automated decision-making to make advertising more effective and efficient. While building this supercharged surveillance system, companies have promised users and regulators that targeted advertising is mutually beneficial for both consumers and advertisers. In this bargain, users are supposed to receive more relevant ads. Facebook, for instance, explains that its "interest-based advertising" serves users who "want to see ads that relate to things they care about." It's true that these methods can identify ads that connect with users' actual interests. But the very same data-driven techniques that tell a surfer about a new board design can also identify strategic points where people are most vulnerable to influence. In particular, the leading social media advertising systems let political operatives experiment with different ads to see which are the most effective. They can use these tools not only to see if certain issues resonate with particular targets but also test for fears or prejudices that can be invoked to influence political behavior. One key way to do this is to make people feel that someone else represents an emotionally charged threat to their identity. 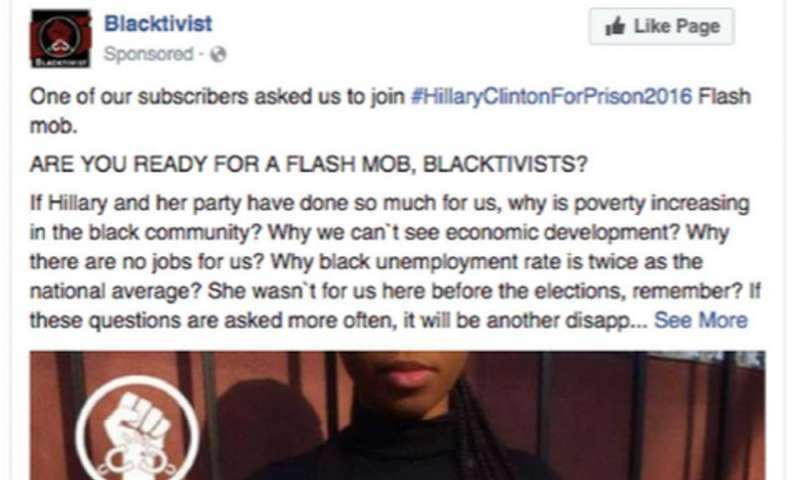 In 2016, for instance, Russia-linked operatives bought thousands of Facebook ads targeted to specific audiences suggesting Hillary Clinton had insulted their group's dignity or threatened their safety. Some ads alleged Clinton espoused disrespect for specific occupations, like coal miners, or racial groups, like African-Americans. Others claimed she would confiscate guns or supported radical political movements seeking to overturn familiar ways of life. Targeting political ads is not unique to online advertising, but the tools of digital ad systems are vastly more powerful than traditional mass media. Advertisers can try out several versions of an ad simultaneously and receive almost instant feedback on which ones most effectively drive specific audiences to share, like or comment on them. This digital feedback loop helps political operatives refine their tactics, probing for just the right images, words and emotions to influence very specific subgroups of citizens. Members of Congress and even some key Silicon Valley figures have begun discussing the need for tighter government oversight and greater accountability in digital advertising. Change need not wait for politics. Based on our analysis, here are some steps companies could take right away – on their own. These moves may hurt the firms' finances, but would demonstrate serious and lasting commitment to limiting their platforms' usefulness in political manipulation campaigns. As their first move, social media companies could stop allowing their ad services to be used as freewheeling experimental laboratories for examining their users' psyches. Just as marketers and academic researchers must obtain permission from their test subjects, political advertisers that run online ad experiments could get informed consent in advance from every user who is involved. Companies should ask for users' consent in specific notifications about ad experiments and not penalize users for opting out by limiting their access to services. We suspect many users would opt out of these tests if given the choice, but in any case this policy would help draw public attention to the hidden manipulation tools that platforms offer to their real customers: the political and commercial advertisers who pay the bills. To increase transparency and limit the ability of special interests to secretly influence politics, social media companies could refuse to work with so-called dark money groups. All political advertisers should be required to disclose their major donors in a format users can easily access. A new policy banning dark money ads would respond to evidence that political operatives have used impersonation and manipulative ad tactics to stir in-fighting or sow division among coalitions of their adversaries. Impersonation clearly work best when ad sponsors are able to hide their identities and motives. Anonymous ads are also more likely to violate ethical standards simply because no one fears being held responsible for them. A more significant change social media companies could make would be to introduce democratic oversight of how they collect and use people's data. Facebook's Zuckerberg recently took an initial step in this direction, announcing that he will create independent review panels to handle users' appeals against the company's removal of content it judges inappropriate. He explained that he wanted to ensure "these decisions are made in the best interests of our community and not for commercial reasons." Whatever you think about this plan – and it has been greeted with plenty of skepticism – Zuckerberg's reasoning acknowledges that because social platforms have become so central to democratic life, their own policies and design decisions require democratic accountability. A more ambitious vision would let independent ethics panels representing diverse communities of users set enforceable policies for ethical political advertising. Similar sorts of groups are common in medicine and are emerging in artificial intelligence, among other fields. The details of how such committees operate will be critical to their success. If these committees are set up in partnership with nonprofit organizations with proven records of advocating for democratic communication and campaign finance transparency, perhaps they could help social media companies earn greater public trust by prioritizing democracy over maximizing their profits. Yeah, but don't you see the huge problem here? Someone is going to lose MONEY if we do all that. What difference does it make who pays for an ad when it says the truth about a candidate? Oh, I agree the companies shouldn't be taking political ads from foreign powers but when it's an ad from people involved I see no problem. Or is the problem that facebook and the others don't want to see any ads against left-wing liberal thieves, murderers, and assorted cohorts? I think it's more the second problems going on myself.